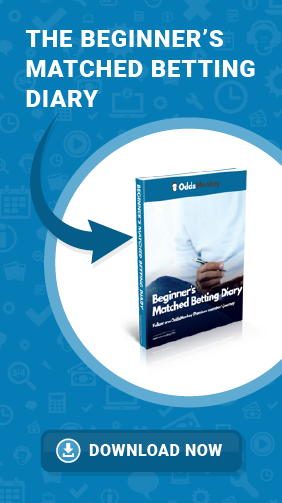 Track matched betting profits with Profit Tracker from OddsMonkey. If you’ve ever found yourself struggling to keep up with your profits, we’ve got the tool for you. 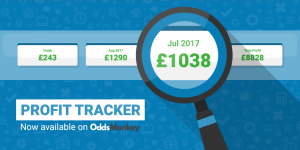 Profit Tracker is fully integrated with all of OddsMonkey’s tools, meaning that you can log all of your bets with the click of a button. Automatically add new entries within each tool. Track your daily, monthly and all-time profits. Track expected profits against actual profits. See detailed stats (monthly profits, profit sources and cumulative profits). Why track your matched betting profits? There are lots of reasons why you should track matched betting profits. For newcomers especially, one of the main things is to be able to see that you’re making a profit – full stop! Its spurs you on to see the numbers going up. And it’ll help you see that the smaller offers add up too. For experienced match bettors, seeing where the majority of your profits are generated is the key to ongoing profits. Again the features of Profit Tracker make this a smooth and easy process. A powerful tool for both newbies and experienced matched bettors alike, Profit Tracker is a simple way to log bets and see statistics. It’s also available to both OddsMonkey Free and Premium members, so sign up today to try it out! Adding selections into Profit Tracker is simple. In fact, it’s a one click process, meaning that flicking between screens and a spreadsheet is a thing of the past. It also means that potential user errors can be avoided. Click the ‘log bet’ button in any of OddsMonkey’s tools and all of the information will be automatically added into Profit Tracker. and discover what sports are making you the most money. Arguably the most important section of the Profit Tracker is the ‘stats’ section. Quickly see your daily, monthly or all-time profits. Or drill down into your profits to see exactly where they’re coming from. Football? Horse racing? The Acca Builder? Filter by sports or any of OddsMonkey’s tools to see where you can concentrate your efforts to increase your matched betting profits. Remember, Profit Tracker is available to ALL OddsMonkey members – Free AND Premium. So get yourself an account today and see how much money you could be making with matched betting.